Years ago, to celebrate our anniversary, my husband gave me a gold necklace with a pendant: too small golden geese flying side-by-side. The geese represent eternal love. Geese mate for life. 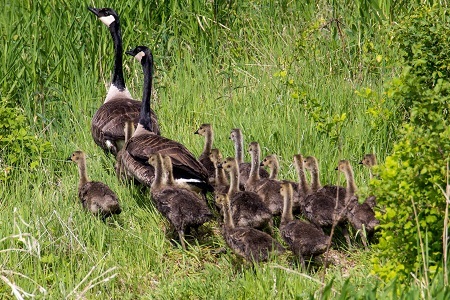 If a goose becomes too old or sick to continue in formation with the rest of the flock, the mate and another goose will fly with the weaker one between them to a place with food and water. The two will wait and comfort the weaker one until either it is able to fly or it dies. Only then will the stronger geese join another flock, where they will be welcomed as newcomers. Geese fly in a V formation. The goose in front actually creates air movement that makes flying easier for the birds behind. When the lead bird grows weary, another moves into lead position. The oldest and youngest geese fly at the back of the V and honk like a cheering section for those ahead. By working together as a unit, these birds can fly great distances that they could never manage alone. How much we can learn about loyalty from geese! Proverbs 17:17 reminds us that, “A friend is always loyal, and a brother is born to help in time of need.” We need to seek out those friends who will support us when we are weak, stick with us no matter what, and cheer us on when we step out to lead. Do we exhibit that kind of loyalty to our spouses and those close to us? When we are committed to others’ well-being – when we value them above ourselves and put their interests first, as Paul instructs the Philippians – we are imitating Jesus and taking on his mind-set. He is the ultimate faithful friend. May we stay faithful and committed to our spouses “until death do us part.” May we take turns in a leadership position and cheer one another on for the long journey ahead. And may we always welcome newcomers and the lost. Think back over the past few years of your life. Which people have been loyal friends to you? How did they show it? Take a moment to evaluate yourself. How well do you cheer on others in their efforts or support those around you who are weak? This week, remember God’s faithfulness and strive to imitate it. Decide on one thing you can do to support a friend who is struggling right now. Lord God, you are the only one who is fully faithful. I am grateful that you will stick by me no matter what. Thank you for the people in my life who show that same kind of loyalty to me. Please help me to extend it to others too, whether it’s my spouse, other family members, friends, and those around me. I want to be a reflection of you.